Hire Hummer Limo can offer you a great range of Hummer limousine hire vehicles. One of these being the H2 Hummer limo hire. The H2 Hummer limousine hire is a stunning limousine hire which is suitable for many events and occasions. If you’re looking for stylish transportation for a wedding, birthday party, airport transfer, hen or stag night, school prom, business event or meeting then you have come to the right place. Our H2 hummers are available in every county across the UK including London, Essex, Kent, Bath, Basingstoke, Berkshire, Caerphilly and Poole. The H2 Hummer limousine comes in a fantastic choice of colours including black for corporate events, orange and yellow for promotional events, pink for hen nights and girl’s parties and white for weddings. Inside the H2 Hummer limousine hire you will find that is comes fully loaded with all the latest gadgets and accessories to enable you and your travelling guest to have a fun filled, relaxing journey. The H2 Hummer limousine hire has luxurious leather interior, Champaign bar, mirrored ceilings, fibre optic lighting, neon mood lighting, crystal glasses, ice and napkins, Hi Fi stereo, CD and cassette player with surround sounds, IPod hook up points, DVD player and flat screen TVs, sun and moon roofs, solid glass privacy dividers, front and rear intercoms, front and rear climate control, alloy wheels and front and rear climate control. 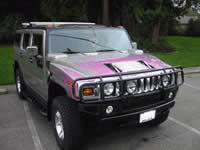 The pink H2 Hummer limousine hire is colour co-ordinated throughout with pink leather interior and matching accessories. This makes ideal transport for a ladies hen night or your little princess’s birthday party where you could have a pink fancy dress theme to match. The H2 Hummer limousine hire can cater for up to 16 passengers comfortably so why not invite all you friends along to enjoy the relaxing journey in the H2 Hummer limousine hire. All the Hummer limousine hire vehicles including out H2 Hummers are COIF certified to comply with the limousine hire laws of VOSA (Vehicle and Operator Services Agency). This means you can rest assure that when you book the H2 Hummer limousine hire for your event, occasion or transportation needs nothing will go wrong. For more information on the H2 Hummer limousine hire and the other types of Hummer limousine hire vehicles including the H3 Hummer limo hire, the Baby Hummer limousine hire and Hummer style limousines, call us. For a no obligation quotation for the H2 Hummer limousine hire click the “Get a Quote” icon or call to speak to a member of staff who will be happy to find the right Hummer limousine hire to suit your event or occasion perfectly.